We interviewed one of IKEA’s Food Heroes to get valuable tips on how commercial kitchens can follow the IKEA example and cut food waste by half. With its Food Is Precious initiative, IKEA aims to halve food waste before the end of August 2020. To achieve this, the group has chosen Winnow as one of its two key partners. Using our smart scale, IKEA can understand the source of its food waste, measure it, and thereby reduce it. In a little more than a year since the rollout of the initiative, IKEA has globally saved more than 1 million meals. That’s over 450,000 kg of food, which is enough to feed one thousand people for a whole year. 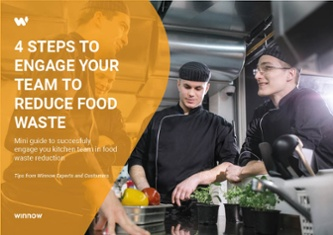 We talked to Christina Prince-Wright, Kitchen Production Manager at IKEA Southampton - UK, to give you an insight into how her kitchen has managed to save over €87,500 by reducing food waste. Before joining IKEA I was working as an Assistant Teacher at a local school. But, being Swedish, as soon as I heard that IKEA was going to open a store in Southampton, I was determined to get a job here. I just wanted to have the opportunity to use my native language, while working for a renowned company. For me, food is a way of sharing cultures and bringing people together. That’s what inspires me to work with food. I feel extremely privileged to be able to contribute to keeping the Swedish culture alive through the love of food. It’s great to work at IKEA Food and show to the world that there are more to Swedish cuisine than meatballs and mashed potatoes. I was never formally trained, but cooking has always been a major part of my life. As a child, I used to often cook with my grandmother. She was a great cook and a professional recipe tester. I learned a lot from her. Also, I had five children, and I was a childminder before becoming an assistant teacher. For many years, I looked after 10 children a day. So cooking, and more importantly, cooking nutritious food, has been one of my main priorities. When we started training the team to use Winnow, the main challenge was to make them understand that we wanted to track our food waste and not their performances. We focused on telling the team that the results from the Winnow report could eventually highlight some training needs, but the main objective was to reduce our food waste. After the team started seeing the amount and the value of the food that was getting wasted, they understood the importance of the initiative. Now, everybody is fully on board and we are always pushing ourselves to achieve greater results. What initiatives have you implemented based on the data from the Winnow reports? We study the reports every single day. I normally print the most important pages and distribute them to the food champions, to make sure that they will keep the objectives in minds. We often look at the top three weekly errors and focus on fixing them to reduce waste. Also, after Winnow, we have become weather experts. We are constantly looking at the weather forecast to better predict customers demand and avoid overproduction. We find that during sunny days customers prefer buying food that they can easily eat outside, such as, hot dogs and wraps. I believe kitchens will become more and more eco-friendly, and it won’t be different here at IKEA Southampton. Customers are becoming more demanding. They want to know where their food is coming from and what is the nutritional value of it. In the near future, I see technology helping managers communicate this information to customers. What do you do to keep track of the new industry trends? To keep track of the new industry trends I read food magazines, and I often eat at different restaurants to see what they are doing. But, the IKEA global team is always sending us interesting insights. They are very good at keeping us all informed. In the future, I see our kitchen looking beyond food waste to become more sustainable. We plan to start studying ways to use less energy and reduce the amount of single-use plastic we utilize. A good advice to colleagues who are thinking of reducing food waste would be to keep the training fun. The best way to get the collective buy-in from the team is to make the training process enjoyable. You can do that by playing games, start competitions, and even by giving out small prizes to the champions. My main tip is to concentrate on the top three errors of the day or the week. It’s the easiest way to keep everybody focused. You could focus on cooking a smaller amount of a particular dish or retraining the team reduce cooking errors. Whatever works best for your situation. We are achieving great results by doing that. We’ve reduced our food waste by 75%. Jamie Oliver is my favourite chef. I admire him because he makes cooking look fun and easy. Jamie Oliver is great at encouraging people to replace their takeaways and ready-meals with home-cooked meals. My favourite dish is pike pate with wild mushrooms and new potatoes. I have great memories of this dish because my grandmother used to cook it all the time. She lived in a very remote place without any supermarkets close by. So, she would cook everything from scratch, and even fish the pike herself. Hong Kong is the best place to eat out in the world. I lived there with my family when I was a teenager and I loved eating out and trying new cuisines. Everything was so exciting.